I was hungry one night. So I said to my assistant: “Why don’t we bake something? Will you help me?” What a dear husband I have. This is a chocolate cupcake with peppermint ganache filling. I used the Cooks Illustrated recipe for Ultimate Chocolate Cupcakes with Ganache Filling that I previously blogged about, but added peppermint extract to the ganache. The frosting is a peppermint buttercream (add peppermint extract to any basic buttercream recipe). 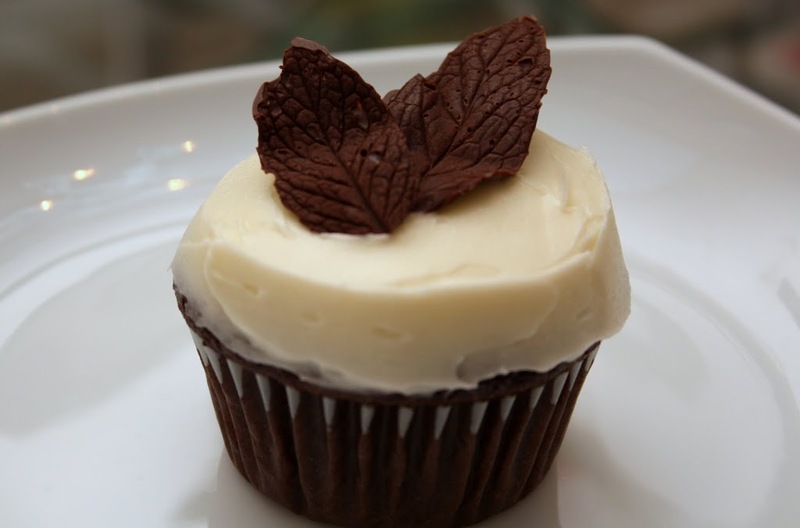 I then topped off the cupcakes with dark chocolate mint leaves, which were made by brushing tempered chocolate on the back of mint leaves, and then peeling off the leaves once the chocolate has set. I’ve made these cupcakes a few times before, but I think the use of Ultimate Chocolate Cupcakes this time around was a vast improvement over the one-bowl chocolate cupcakes that Martha Stewart’s book suggests. However, ultimately, the mint leaves are what make these cupcakes so special.